Time to draw up a plan? Do you need a reason to finish that business plan you’ve been working on? It might help knowing that not finishing it could affect your chances of business success. An interesting study has emerged from Silicon Valley’s Tim Berry, a popular blogger and founder of Palo Alto Software. His company did a study of the correlations of completion of a business plan with different success variables such as business growth, securing investment and securing a loan. 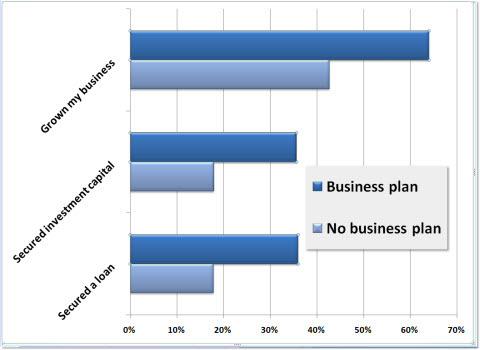 Although the study was for people who had completed their business plan using his company’s Business Plan Pro software, the results still shed some light on the difference in business success metrics between those who complete a business plan and those who don’t. The exercise of planning that goes into a business plan is probably the key element here. Planning forces you to analyze and make initial decisions on important areas of the business like your revenue model and your financial needs. It forces you to research your competition and your customer. It makes you put down previously unstated assumptions and assess the feasibility of your plan. The results of building a business plan are obvious – it can help you to attract investors, partners, employees or a management team. But perhaps most importantly, it helps you set goals and milestones and plan your efforts to best build your business. Yet as we all know, not everything goes as planned. And many of the most famous companies in the world only succeeded after several failed business plans and models. So your first business plan will likely not be your last. But having a plan (at least initially) and moving forward on it allows you to test out your assumptions (for example, that customers will pay what you think they will) and change where necessary. Testing your initial assumptions and re-planning quickly and early can allow you to change course and redirect as soon as possible. Looking to build a business plan? Check out the Entrepreneur’s Toolkit Workbook on The Business Plan and Executive Summary which can guide you through the process. Already working your business plan? An excellent article on how you can test your initial assumptions and break through to a Plan B business plan quicker can be found online at MIT Sloan’s Management Review’s A Business Plan? Or a Journey to Plan B?